I posted the the following over at SSP and I am curious as to people's opinions on why a region of nearly 3 million people flies so low on the national radar. Do you think most residents like it that way? The area is the size of places like Cleveland, St. Louis, Phoenix, and the Twin Cities but gets the same kind of recognition as Rochester, Omaha, and Tulsa. If the three cities worked in unison could they ever rise as one on the national scene? One of the most unassuming areas that is really surprisingly large is the corridor between New Haven and Springfield anchored by Hartford in the middle. This is a region of of nearly 3 million people that gets not nearly enough recognition because none of the three cities sticks out as a large city in it's own right and for the fact that they are all three sandwiched in by the behemoths that are New York and Boston. The corridor is a supreme higher education center including Yale, Trinity, Wesleyan, University of Connecticut, University of Hartford, University of Massachusetts, Amherst, Smith, and Mount Holyoke to name of few. The corridor's largest urban area, Hartford, is a major player in the US economy. The Hartford MSA has the highest Gross Metropolitan Product per capita in the United States. Finally, I believe this area to be most beautiful with rolling hills and the spectacular Connecticut River Valley which has a great collection of charming villages including Old Saybrook, Essex, Deep River, East Haddam, Wethersfield, Longmeadow, Northampton, and Deerfield. I was a longtime resident of the area and I really miss living there. It was a great place to grow up. We are on the same page. I truly wonder the same thing. When you factor in the affordability factor as well the 91 corridor should be a cohesive boom area. Maybe eventually or even sooner than we think we will be. A lot is riding on a handful of projects including the rail project. I posted the the following over at SSC and I am curious as to people's opinions on why a region of nearly 3 million people is so low on the national radar. Do you think most residents like it that way? I couldn't agree more!!! Connecticut and Hartford are very important components of the US economy, that cannot be ignored. I agree, also. Speaking about the Springfield/Hartford connection, a problem is that residents don't seem to "feel" like they are all part of the same metro area. I think a large reason for that is because not a lot of people really depend on one that live in the other. In Springfield all you hear about is Pioneer Valley, and in Hartford all you hear is "Greater Hartford". There isn't really even a good name for the region at this point that makes people feel like they are all part of the same region. What should the name be, Connecticut Valley? Learning Corridor? You could say they use the term Southern New England, but that seems too broad. I think some of this will start to change as the rail line is created. I think this is vitally important, because with that you will have more people who live in Greater Hartford but work in Pioneer Valley. As a result you are going to see people identify with either one or the other, and simply feel like they are in one cohesive unit. This is what I hope happens at least. Sprawl is not a problem in Connecticut. It is one of the Courant's silly politically correct obsessions. A tiny bit of sprawl exists along Route 44 in Avon. And compared to other places in the USA, it's nothing. Hell, it's not even sprawl, it's just nromal development. Go a mile off Route 44 and you are in the country again. The Courant is ridiculous. Actually there is a ton of sprawl. Take a look at Canton. Those farms and golf courses, all gone...for strip malls and chains. Manchester, South Windsor, Rocky Hill, Glastonbury. Does every town need a McDonald's, Wal-mart and Chilis? None of that is really sprawl, it is big box stores, and the 2 are NOT synonymous. All this housing sprawl that so many of you think is bad is not really a problem, especially in CT.
Housing and suburban sprawl actually peaked in the late 1950's and has been declining ever since. 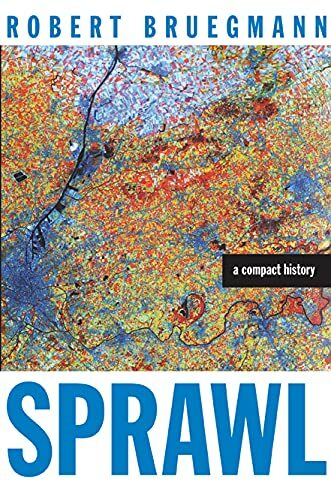 Read "Sprawl, A Compact History." Good book. "Go a mile off Route 44 and you are in the country again"
The two are not synonymous, but are certainly complimentary. Of course suburban sprawl peaked in the 50s, but we have been building that way ever since. Just because there is less sprawling development than there was then doesn't mean sprawl is not a problem. The land which we have developed in such a wasteful fashion is not somehow coming back. Ignoring a problem isn't going to make it better. Let me guess, you discount global warming too. Well, if there are people there willing to shop or eat at those places, yes. There are two McDonald's in Vernon and several in Manchester. All are doing well. There is a Chilli's in Manchester and one in W. Hartford. Again, both doing well. Like it or not, people do like to shop at Wal-Mart and they do like to eat at places like McDonald's and Chilli's. I like local restaurants, but I also enjoy eating at chains once in a while. And yes, I have even shopped at Wal-Mart once in a while, and the store I go to is always busy. One thing I don't like about the anti-big box/chain argument is that it seems to completely discount the popularity of these places, as if to say the choices made by those consumers is not relevant and they should not be given the option to shop or eat at these places. In my opinion, it's a bad way of attracting allies. Global Warming is real. I am not ignoring any problem. I do not see any problem. Sprawl is nothing new, it is nothing threatening. It has been around since ancient times. sprawl is a big problem in CT. sprawlis generally defined by how walkable an area is. while a suburb doesn't necessarily mean sprawl, that's generally the case in CT. look at route 1 almost all the way across the state. look at wallingford (i think it's route 5 there that's the problem). look at the buckland area of manchester and route 6 in windham. they're all sprawl. i won't even mention fairfield county, which is the definition of sprawl in CT. there's small walkable areas in most towns, but this is generally a strip of less than a mile and everything else requires a car. auto-centric environments define sprawl. so while hartford itself isn't filled with sprawl, the areas surrounding it and all over the rest of the state are. the same can be said about the other cities... they're not sprawled out, although some have very sprawling neighborhoods, like new haven's westville section on whalley ave. it's not very walkable. i think you need to get out and look at the rest of the state. it's very sprawled out. other parts of the country are worse, but the rest of new england is not nearly as bad as CT.
sprawl is threatening when you consider that cars are the biggest contributor to global warming. Rt44 past Canton is all country. There's really no sprawl out that way. Anyway in my opinion sprawl is a major problem in CT. Forget comparing us to other states, I think its a big problem because sprawl has hurt our cities in CT and will hold them back from thriving once again. Some of Hartford's inner suburbs (Wethersfield, for example) are completly built up and have struggling retail markets which is all making suburbs push farther out. 10-15 years ago suburbs such as Marlborough and Hebron out in eastern CT were not considered true suburbs of Hartford but today many people think of them as just that. There are places when you can go not to far outside of the city and see country and not sprawl. Look at some areas in Boston and yes even New York City. Right now theres places like the Berlin Turnpike, Silas Deane Highway, Rt 44 (West Hartford, Avon and yes I hate to say now part of Canton), Buckland Hills area, Somerset Square area, etc. all you are referring to is stores...chain stores...buckland, the turnpike? that is what is ruining "Ct's charm"? stores? do you want the state to kick all the stores out and put trees back there? Strip malls are a defining characteristic of sprawl! They exist as a destination for the car and come about because the towns in CT have such poor development restrictions and no town centers with retail, thus forcing everyone on the highway. Suburbs are one thing but you have to have some form of density to make the town self-sufficient which is the cure for sprawl. To say that CT doesn't have a sprawl problem is laughable! Each year there is a new development popping up in the middle of the forest with ZERO urban planning! They often have foolish faux-high-class names like, "Stonybrook Villas" or "The Residences at Vista Point" or such nonsense. he's not describing stores, he's describing automobile-centric development, meaning you can't really get there without a car. the berlin turnpike is not at all walkable. the buckland area is not walkable. the post road in milford is not walkable. almost all of fairfield county is not walkable. then you can't forget about all these new residential communities that are being built that don't really help the situation any. Next to parking lots, strip malls are the biggest waste of space ever. Here's the thing with the Berlin Turnpike, it didn't just pop up yesterday, it's been like this for over 60 years. It was the main NYC/Boston Route before the interstaes, hense all the motels. I have always thought of the Berlin Turnpike as the first example of sprawl in this region. It was sprawl way before the new meaning of the word. I have heard many people say "Berlin Turnpike type development" in describing what we now simply call sprawl. The McDonalds on the Berlin Turnpike in Newington is one of the first. you guys arent looking for enough into it. You see more cars=>instant global warming=>bad. you are just scratching the surface. Sprawl is entrenched in conventional wisdom about urban thinking as one of the most negative and evil descriptions to some in the entire lexicon about modern cities. The sprawl you are quoting is basically land consumption, long commutes in gas-guzzling SUVs, and therefore global warming and big-box retail. There is so much more to it than that, and it goes in big cycles. America's sprawl problem was in the decline of our cities a century ago. These cycles have happened to every city and civilization for thousands of years. The fact that you want to attribute ALL of global warming to driving our cars is naive. so are you saying sprawl is good or bad? i'm really confused. yes, sprawl started a century ago as people moved out of the cities. it didn't become as big a problem until the 50's with the increased suburban development and it was all downhill from there. I dont think sprawl is a big problem in CT. Its becoming less of a problem in the country overall as well. then you haven't been to much of CT, which still includes fairfield county, last i checked. even the beloved rural area of SE CT is adding sprawl to rt 85 in waterford with the new shopping plazas across from the crystal mall.